The Intelsat 20 communications satellite has joined its HYLAS 2 co-passenger on Ariane 5, marking a new milestone in preparations for Arianespace’s heavy-lift mission next week from the Spaceport in French Guiana. The encapsulated Intelsat 20 satellite is ready for lowering into position over HYLAS 2, which previously was installed atop Arianespace’s Ariane 5 to be launched on August 2. Encapsulated in an ogive-shaped payload fairing, Intelsat 20 was lowered into place yesterday over the HYLAS 2 satellite, which was installed atop Ariane 5’s cryogenic core stage earlier in the week. With the Ariane 5’s dual payload “stack” now completed, final pre-flight preparations will begin, including functional tests, a rehearsal and transport vehicle aiming. This will be followed by the launch readiness review and rollout of the heavy-lift workhorse to the Spaceport’s launch zone for the August 2 liftoff. Weighing approximately 6,090 kg. at launch, Intelsat 20 was built for international satellite operator Intelsat by Space Systems/Loral of the United States, based on its 1300-series platform. This spacecraft will replace the Intelsat 7 and Intelsat 10 satellites and is to provide video, telephone and data transmission services for Europe, Africa, Russia, Asia and the Middle East. Also being orbited on the upcoming mission is Avanti Communications’ HYLAS 2, which is equipped with 24 Ka-band transponders and will provide low-cost, high-speed data communications to Europe as well as the growing regions of Africa and the Middle East. 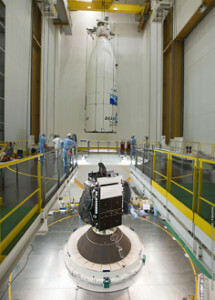 This flight marks the fourth for Arianespace’s heavy-lift launcher in 2012. Europe’s third Automated Transfer Vehicle for the International Space Station was orbited by Ariane 5 in March, and the JCSAT-13 and VINASAT-2 spacecraft were lofted during May. The EchoStar XVII telecommunications and MSG-3 meteorological satellites were orbited by the vehicle earlier this month.